We continue outlining the basic elements of the science denier’s toolbox; the first four basic elements were covered in Part I of this blog entry. It should also be noted that the original Lancet article which launched the MMR scare has long since been retracted by the journal, and the “research” by Andrew Wakefield that it reported has been found to be fraudulent. Human activity plays no role in climate change. The science is unsettled, so it’s premature to act. Rising carbon dioxide levels have no correlation with global temperatures. More carbon dioxide is good for you: levels were high 500 million years ago in a period of rapid evolution. Even if human activity is causing problems, it’s too costly or too difficult to do anything about it. It’s a Chinese hoax to gain economic advantage. All these arguments are easily refuted, but with no impact on deniers’ conclusions. For example, to refute argument 4 in this list, we show below the peer-reviewed data from Antarctic ice cores showing an extremely clear and strong correlation between carbon dioxide levels and temperatures spanning nearly a million years. In light of this correlation and the current CO2 concentration shown at the extreme right of the upper curve, there is every reason to be greatly concerned about future global temperatures. Argument 5 in the above deniers’ list is an example of including a partial truth, but hiding the full story. CO2 levels were much higher several hundred million years ago, but: (a) the Sun was significantly weaker then; (b) there were no humans to be massively displaced; (c) rapid changes in CO2 levels, over periods too short to allow evolutionary adaptation, are harmful; (d) the latter point has a clear historical illustration from massive volcanic (so-called Large Igneous Province, or LIP) eruptions that produced rapid buildup in atmospheric concentrations of greenhouse gases (both carbon dioxide and methane) and mass extinctions of living species that populated Earth at the time of those eruptions. The plot reproduced below shows when the fossil record indicates that those mass extinctions occurred. The alignment of nearly all of them along the zero line in the plot indicates that they are very strongly correlated with the independently inferred times at which the massive LIP volcanic eruptions occurred. The fact that greenhouse gas concentrations are now rising more rapidly than it did from those eruptions should hardly convince one that rapidly rising CO2 levels are of no concern! The figure below shows the covers of some of these mass-media denial documents: books, compact disks, pamphlets. Some of the deniers’ “research” documents may appear to be published in peer-reviewed scientific journals, but it is important to probe the reputation of the journal. For example, the Global Warming Petition Project has solicited some 31,000 signatures from self-proclaimed scientists opposing the conclusions of the Intergovernmental Panel on Climate Change, by sending to prospective signers a “summary of peer-reviewed research” whose title, authors, abstract and journal are shown in the figure below. Now you would be correct to wonder what a review on environmental impacts is doing in the Journal of American Physicians and Surgeons. The answer is seeking friendly peer review for publication. This journal is published by the American Association of Physicians and Surgeons, a conservative non-profit association founded in 1943 to “fight socialized medicine and to fight the government takeover of medicine.” It is a journal best known for its ideologically strict but scientifically feeble peer reviews, and for publication of questionable research including, for example, the deeply flawed studies by the Geiers about potential links between vaccines and autism, referenced under the discussion of toolbox element (5) above. When authors choose to publish in a journal with such a reputation, it is a pretty strong indication that their work would not survive a rigorous review by a reputable science journal. Occasionally, deniers go further to simply doctor articles from reputable media to fake support for their denial. The classic case is the widely distributed, but faked, Time Magazine cover from 1977 on the left side of the figure below, doctored to make a visual point that scientists can’t make up their minds on whether the planet is cooling or warming. But as shown in the figure below it, the real Time cover from 2007, from which the doctored copy was generated, accompanied a story that made precisely the opposite point. The use of fraudulent memes seems to convince some members of the unsuspecting public. Think tanks such as the Heartland Institute are excellent examples of collections of professional science deniers who move from topic to topic. In the past, the Heartland Institute worked with the tobacco industry, Frederick Seitz and S. Fred Singer to question links between smoking, secondhand smoke and health risks. One of their publications was entitled “Joe Camel is Innocent!”. They advertise themselves now as “the world’s most prominent think tank promoting skepticism about man-made climate change.” As we will elucidate in a future blog entry dissecting their booklet “Why Scientists Disagree About Global Warming,” their promotion veers much closer to denial than to skepticism. They currently dismiss any dangers of fracking, and they’ve written model legislation to repeal mandates promoting development of renewable energy sources. Their leaders cut their teeth denying ozone layer depletion and acid rain. Their “science” reflects neither expertise nor a winning (or even respectable) track record, but rather a consistent Libertarian viewpoint (“All government regulation is bad!”) with ample industrial sponsors. Their expertise is only in exploiting the science denier’s toolbox outlined here. Proponents of the Heartland Institute viewpoint argue that any government regulation is a step along a “slippery slope” toward tyranny. 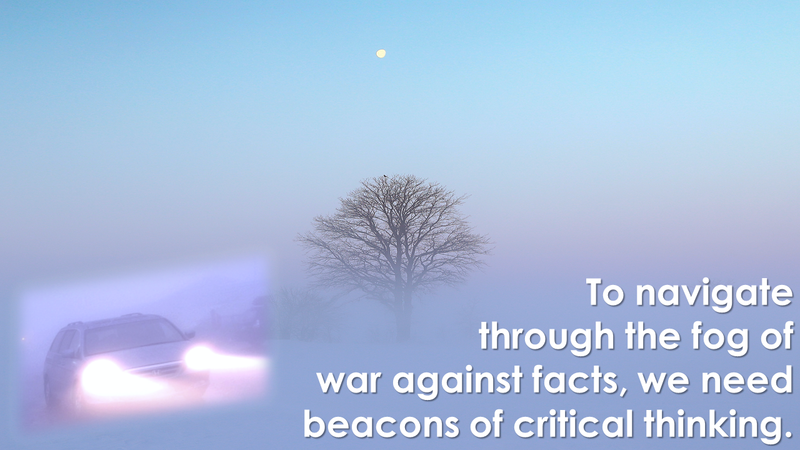 But in fact tyranny thrives on war against facts. As history reveals repeatedly, authoritarian governments promote ideology of any sort (Communism, Nazism, Libertarianism, etc.) over evidence as a basis for policy decisions. Man…i was really agreeing with you all the way until the end. Authoritarian governments promote libertarianism? You should realize that libertarianism is in direct opposition to authoritarian government. Other than that one perplexing comment, i like the site! Extreme libertarianism is currently being exploited to deny science and muddy factual waters. This is ammunition for the war against facts that authoritarian regimes thrive on, telling the people that only the regime can supply them with the truth. Tyrants exploit ideology, they don’t have to actually believe the ideology themselves. I appreciate the comments. Keep keeping us honest. The point is not that most libertarians seek an authoritarian government — of course, they don’t. Most early believers in communism also did not seek authoritarian governments, they were hoping to move away from tyranny. The point is that when you begin to believe that defending your political viewpoint — whatever that may be — justifies dishonesty about facts (and that’s what science denial is, as opposed to science skepticism), you are playing into the hands of would-be tyrants, who seek to exploit confusion about facts, making their world safe for the supremacy of propaganda and for their control of narratives. Riling up the masses to support your narrative and suppression of facts that question it (e.g., by eliminating research or undermining an independent press and judiciary) are central tools of tyranny. Government regulation is, at best, a minor possible technique of authoritarians. There are honest ways to argue in favor of the libertarian viewpoint, but the Heartland Institute and other groups have gone beyond that. They may well be planting their flag on the wrong slippery slope.